Indonesia as an agricultural country with staple food of rice, has huge rice husks resources. Rice husk production in 2006 was 10,891,980 tons and in 2015 was 15,079,560 tons with growth rate of 3.85% per year. The purpose of this study is to examine rice husks as an alternative to renewable energy fuels. According to Indonesia’s renewable energy policy, the target of renewable energy application is 23% out of total energy by 2025. Nevertheless, the average percentage of renewable energy using is just 0.19% per year in the last ten years. Rice husks need to be dried before burning it to obtain heat value. In this study, the rice husks were dried by solar heat. Measurement of water content of rice husks were performed by gravimetric method at Research and Standardization Laboratory, Medan, Indonesia. Dried rice husk samples were burned in calorimeter bomb to acquire the burning temperature and heat value and the tests were performed at Basic Phenomenon of Mechanical Engineering Laboratory, Institute Technology of Medan.The results showed that High Heating Value (HHV) was 11.03 MJ / kg. Rice husks energy generated according to production in 2015 equivalent to 5,075,588,554 liters of Pertamax gasoline which worth US $ 3,182.003,594. Furthermore, if rice husks were utilized for electricity power generation, 25,635,252,000 kWh of electricity will be achieved and it is worth US $ 2,665,912,362.It is concluded that the rice husks can be developed as one of potential renewable energy fuel to accomplish 23% target of renewable energy application by 2025. Indonesia as an agricultural country with staple food of rice, has huge rice husks resources. Rice husk production in 2006 was 10,891,980 tons and in 2015 was 15,079,560 tons with growth rate of 3.85% per year. 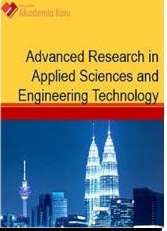 The purpose of this study is to examine rice husks as an alternative to renewable energy fuels. According to Indonesia’s renewable energy policy, the target of renewable energy application is 23% out of total energy by 2025. Nevertheless, the average percentage of renewable energy using is ​​just 0.19% per year in the last ten years. Rice husks need to be dried before burning it to obtain heat value. In this study, the rice husks were dried by solar heat. Measurement of water content of rice husks were performed by gravimetric method at Research and Standardization Laboratory, Medan, Indonesia. Dried rice husk samples were burned in calorimeter bomb to acquire the burning temperature and heat value and the tests were performed at Basic Phenomenon of Mechanical Engineering Laboratory, Institute Technology of Medan. The results showed that High Heating Value (HHV) was 11.03 MJ / kg. Rice husks energy generated according to production in 2015 equivalent to 5,075,588,554 liters of Pertamax gasoline which worth US $ 3,182.003,594. Furthermore, if rice husks were utilized for electricity power generation, 25,635,252,000 kWh of electricity will be achieved and it is worth US $ 2,665,912,362. It is concluded that the rice husks can be developed as one of potential renewable energy fuel to accomplish 23% target of renewable energy application by 2025. Resilience of a country, influenced by energy security. Much of the world's energy comes from fossil fuels, owned by a few countries, at prices that fluctuate and damage the environment. To overcome energy dependence and reduce environmental damage, many countries turn to renewable energy. One of them is biomass . Regarding to Indonesia's renewable energy policy, the target of renewable energy application will be 23% by 2025. The growth rate of renewable energy is only 1.98% per year within the past 10 years. 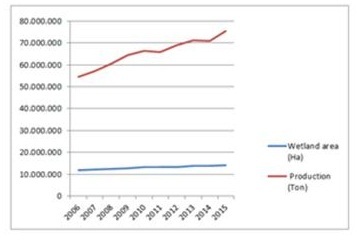 The growth rate in 2010 and 2015 were 4.42 % and 6.2 %, respectively. The potential of renewable energy resources estimated 800 GW and utilized about 1 % up to now. Geothermal Renewable Energy resource is about 16,502 MW and utilized 1,341 MW. In addition, hydro energy is 75.000 MW and consumed 7,059 MW. While micro hydro, wind, sun energy are 769.7 MW, 950 GW and 4.8 kWh / m2 / day (112 GW peak) and utilized 512 MW, 1.33 MW and 452.78 MW, respectively. Furthermore, 453 MW from coal methane gas, 574 TSCF from shale gas, 28,8 GW from geothermal. Also, ocean current can generate 60GW and biomass at 32,654 MW which newly exploited at 5.2 percent . Biomasses are in the form of rice straw, rice husk, cotton stalk, corn cob, wood chips and others . As an agricultural country with staple food of rice, rice and rice husk production continue to increase. Increased rice production is supported by the expansion of planting area from 11,786,400 ha in 2006 to 14,116,600 ha in 2015 with an expansion rate of 19.77 percent. 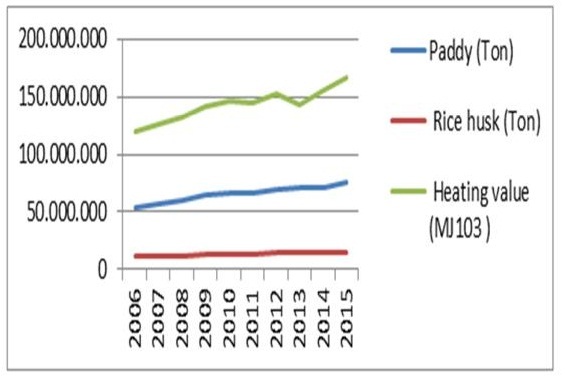 Production of paddy , ,  in 2006 reached 54,459,900 tons and in 2015 reached 75,397,800 tons, with production rate of 3.84% per year. Graph of the relationship between planting area and rice production in 2006-2015 is presented in Figure 1. The rice mill produces 72 percent rice, 5-8 percent rice bran, and rice husk 20-22 percent , 20 percent  , 18-23 percent , 20-25 percent , and 14% -27%  of rice weight. Grain burning rice value 7.81 MJ / kg , 12.1-15.2 MJ / kg , 13.24 MJ / kg  , 13,481 MJ / kg  and 17.4 MJ / kg . Rice husk utilized for household fuel and 10%  burning of the soil , polluting the air  with methane gas . CH4 gas is 72 times more dangerous than CO2 gas to global warming . Caloric energy of rice husk can be obtained by open burning, gasifier stove , rice husk briquettes . In its application 1.6-1.8 kg of rice husk is converted to 1 kilowatt-hour . The cost of producing electrical energy from fuel rice husk is much lower (3.75) than coal fuel (10,260) and diesel (94,000) . 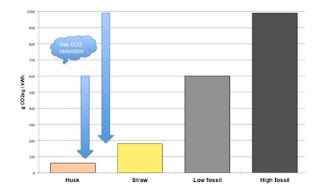 The reduction of CO2 of rice husk (75 g CO2eg / kWh) is smaller than the straw fuel (180 g CO2eg / kWh), low fossil (600 g CO2eg / kWh) and high fossil (995 g CO2eg / kWh) . CO2 emissions can be reduced by perfect combustion . Burning ash from 17-26% , can be used for brick making, cement , concrete additives , natural agricultural fertilizer  and poultry incubation . Biomass power generation, has feasible engineering , economic feasibility , gross fuel solution , as renewable energy ,, environmentally friendly , ,  and meeting the needs of local communities . The rice husk power plant is included in the Clean Development Mechanism (CDM) . Testing of rice husk water content has done by gravimetric method at Laboratory of Research and Industrial Standard Center of Medan, Climate and Industrial Policy Assessment Office, Ministry of Industry Republic of Indonesia in Medan. Testing the calorific value of rice husk using calorimeter bombs at Phenomenon Laboratory, Department of Mechanical Engineering, Faculty of Industrial Technology, Medan Institute of Technology. The highest heating value (HHV) is calculated by the equation: HHV = (T2 - T1 - Tkp) x cv (kJ / kg), where Cv = hot bomb type calorimeter 73,529.6 (J / gr.°c) and T kp = temperature rise due to ignition wire = 0,05°C. The lowest heating value (LHV) is calculated by the equation: LHV = HHV - 3.240 (kJ / kj). T1 = cooling water temperature before turn on (oC). T2 = the cooling water temperature after being turned on (oC). Tkp = increase of igniter wire temperature (oC). cv = heat type tool (73.529.6 kJ / kg.oC). Testing of heating value has done by 3 times repetition with calorimeter bomb obtained an average HHV of 11.03 MJ / Kg. This fuel value is still above 7.81 MJ / kg  and below 12.1-15.2 MJ / kg , 13.24 MJ / kg , 13,481 MJ / kg  and 17.4 MJ / kg . 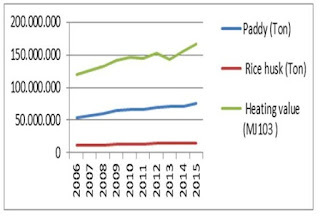 The average percentage of rice husk 20 percent of the weight of paddy, the rice husk obtained in 2006 reached 10,891,980 tons and in 2015 reached 15,079,560 tons with an average increase of 418,758 tons per year. Fuel value of rice husk 120.138.539x103 MJ and 166.327.547 x103MJ in 2015 with growth of 4,618,900.8 x103MJ per year. The production data and the rate of rice husk production and the data and the calorific value of rice husk in 2006-2015 are presented in figure 3. By the fuel gasoline Pertamina - Pertamax type (Octan 92) the calorific value of 10.575 cal / gram, the specific gravity of 0.74 kg / liter, then the calorific value of rice husk husk in 2006 (3.666.102.240 liter) and in 2015 (5,075,588,554 liter) with the growth of 140,948 .631.4 liters of year. Price Pertamax (Octan 92) Rp.8.150 / liter equivalent to US $ 0.62 , then the value of equivalent rice husk worth in 2006 (US$.2.289.364.097) and in 2015 (US$ 3.182.003.594). The increase in rice equivalent of rice husk with Pertamax fuel and increased Pertamax purchase price for 10 years reached 38.45 percent or 3.85 percent per year. 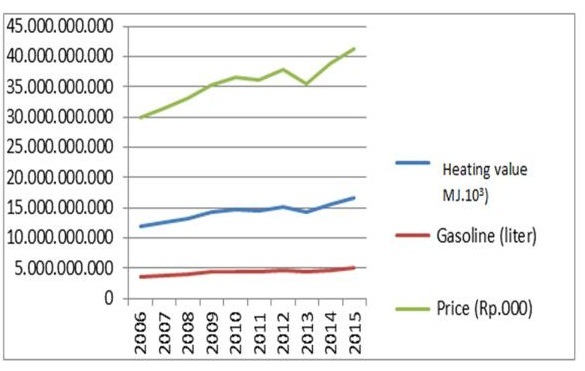 The data of Pertamax equality and rate as well as the data and rate of purchase of pertamax in 2006-2015 are shown in figure 4. Rice husks can be synchronized with the electrical energy generated from the biomass power plant. Each kilogram of rice husk produces an average of 1.7 kwh. 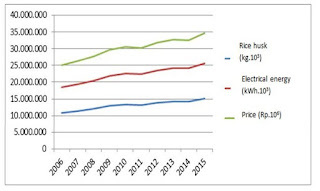 The equivalent of electric energy from rice husk in 2006 reached 18,516,366,000 kWh and in 2015 reached 25,635,252,000 kWh with growth of 7,118,886,000 kWh in 10 years or 711,888,600 kWh per year. The lowest non-subsidized electrical energy in Indonesia (900 VA) is sold in Indonesia Rp.1.352 / kWh). 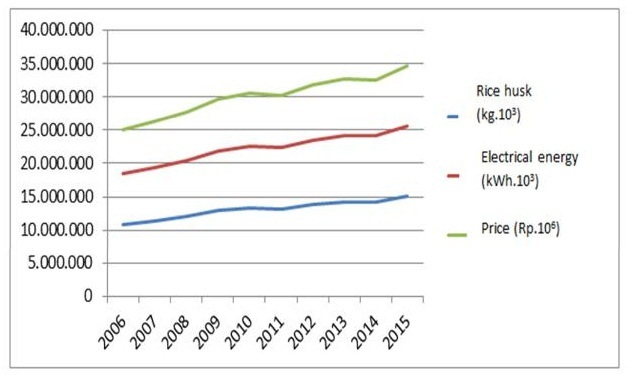 The selling value of electric energy from rice husk in 2006 reached US$ 1,925,702,062 and in 2015 reached US$ 2,665,912,362 with the growth of US$ 740,210,300 in 10 years or US$ 74,021,030 per year. The increase of electrical energy and the selling value of electrical energy for 10 years reached 38.45 percent or 3.85 percent per year. 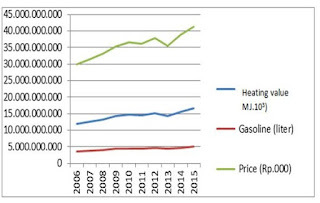 The data of electrical energy, the rate of electrical energy and the data of selling value and the rate of sale value of electric energy in 2006-2015 are presented in figure 5. 1. Rice production was 54,459,900 tons in 2006 and 75,397,800 tons in 2015 with production rate of 38.45 percent. Production of rice husk in 2006 was 10,891,980 tons and 15,079,560 tons in 2015 with production rate 418,758 tons per year. 2. The caloric value of rice husk is 11.03 MJ / kg. Consequently, the rice husk production in 2006 generated 120.138.539x103 MJ which is equivalent to 3,666,102,240 liters of Pertamax gasoline and in 2015 produced 166,327,547 x103MJ equivalent to 5,075,588,554 liters of Pertamax gasoline. If rice husks are applied as a source of electrical energy, it will produce 18,516,366,000 kWh of electricity in 2006 and 25,635,252,000 kWh in 2015. 3. The economic value of rice husk, its energy equivalent to the Pertamax gasoline purchase in 2006 was US $ 2,289,364,097 and in 2015 was US $ 3,182,003,594. When rice husks were utilized to produce electrical energy, in 2006 equal to US $ 1,925,702,062 and in 2015 US $ 2,665,912,362 with growth of US $ 74,021,030 per year. 4. Rice husks are very prospective as an alternative renewable energy fuels in Indonesia.